December 1990: External inspection reveals the building to be in poor condition, with the upper floors vacant for over 10 years. Developers have expressed an interest but the principal owner lives in Hong Kong and does not wish to sell. January 1991: A Repairs Notice is served. Glasgow District Council considers compulsory purchase. September 1995: Local planners report that the condition is deteriorating with extensive stone repairs required. Repairs are subsequently undertaken following an Urgent Works Notice. 24 August 1995: The Scotsman reports that consent has been granted for restoration. The building currently suffers from weakened concrete floors and rotten windows and the external walls require stabilisation. Proposed works include stone-cleaning, re-roofing and rot eradication. The owners of the ground floor shops have agreed to contribute £2.3 million towards costs and other sources of funding are to be sought. The owners of the ground floor restaurant, the China Palace, also own the upper 2 floors and have objected to the plans. March 1996: A Compulsory Purchase Order is announced to the press. 1997: The Atrium Hotel Company expresses interest in developing the building. Feasibility studies are undertaken. 23 March 1998: Press reports note that the owners of the upper 2 floors are contesting the Compulsory Purchase Order, halting restoration plans. 11 July 2000: The Scotsman reports that a Dundee businessman, Mr Derek Souter, hopes to restore the building and is awaiting news of grant aid applications to Historic Scotland and Scottish Enterprise. His company, Union Street Properties, acquired 3 retail units in the building at Nos. 84, 88 and 96 in 1988-9, and has now taken responsibility for the upper floors. A fourth retail unit is owned by CIS Properties. Edinburgh-based Morrison Partnership has been employed as architects for the scheme. On completion, the upper floors will pass in full to Union Street Properties. 7 September 2000: The Glaswegian reports that both Scottish Enterprise has withdrawn its offer of grant aid and Historic Scotland has reduced its, the project is unlikely to proceed. 12 July 2001: The Evening Telegraph reports that Union Street Properties are still awaiting a decision on Historic Scotland grant aid. 27 November 2001: The Evening Times reports that Union Street Properties have now formulated 3 rescue plans for submission to Historic Scotland and are seeking £1 million in grant aid. 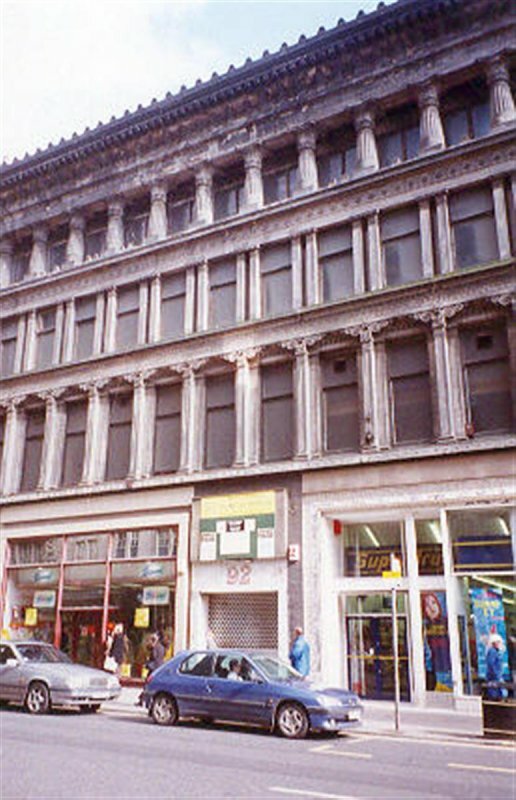 28 December 2002: The Glasgow Herald reports that Glasgow City Council has given Union Street Properties until January 2003 to finalise its funding package. If the package is not finalised, it may withdrawn from the compulsory purchase agreement it has with company and may seek another arrangement with other developers. Union Street Properties currently owns 52% of the building. Glasgow City Council has pledged £100,000 towards the project, with £930,000 from Historic Scotland. The latter comes with certain conditions that Union Street Properties is disputing. 9 January 2003: The Glasgow Herald carries a letter in support of the plans from the Alexander Thomson Society. 20 January 2003: The Glasgow Herald reports that an agreement has been reached. The property will be purchased by Glasgow City Council and will be held until Union Street Properties puts together its rescue package. 12 June 2003: The Evening Times reports that restoration is now estimated at £3.8 million. Works include re-roofing, new guttering, mansonry repairs, rot eradication and window replacement. The cupola will be reinstated and 6 original lamp standards returned to the outside. August 2006: Glasgow Herald reports that works to restore the property are expected to commence next Spring. October 2007: External inspection reveals the upper floors to remain vacant, with the ground floor occupied by retail units. The carved stonework is showing signs of decay especially on the 3rd floor colonade and the entablature. April 2008: Local planners report the Council has recently undertaken remedial works in the interests of maintaining wind and water-tightness, mainly related to the roof. Efforts to progress matters on both the legal front and the full repair of the building are continuing. The building was the subject of a compulsory purchase order/an objection and a case at the Lands Tribunal. May 2008: The Courier and Advertiser reports Dundee based Union Street Properties now own all the Halls, which will enable USP, in conjunction with Glasgow City Council and Historic Scotland, to agree a scheme to preserve the building and return it to commercial sustainability. June 2008: Architecture Scotland reports on the recent purchase of the upper floors of the Halls, giving the USP complete control of the building. 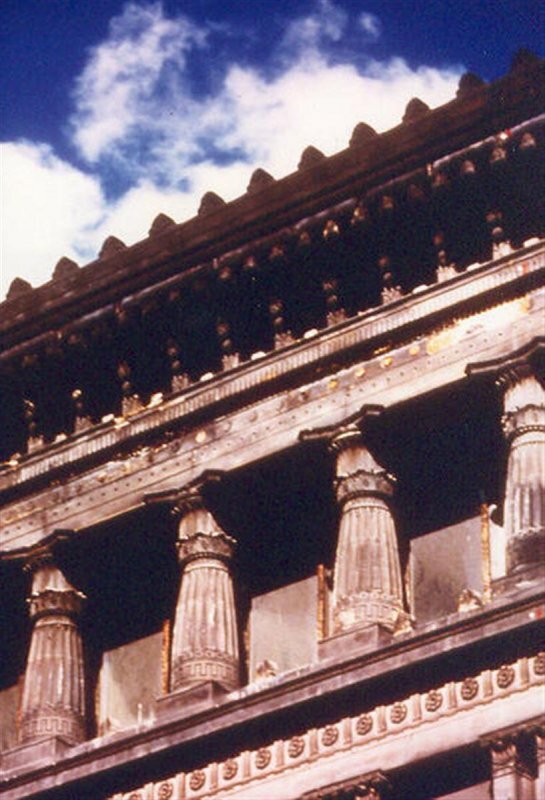 Morrison Architects are reported to have been employed to undertake repair and conservation. A detailed survey is underway, the article goes on to report that on initial inspection the cast iron structure appears sound, but there are concerns about the stone external walls, particuarly where water has escaped from internal pipes. April 2009: Local planners confirm ownership of the entirety of the block is with USP and discussions are underway for the best way forward for the block. 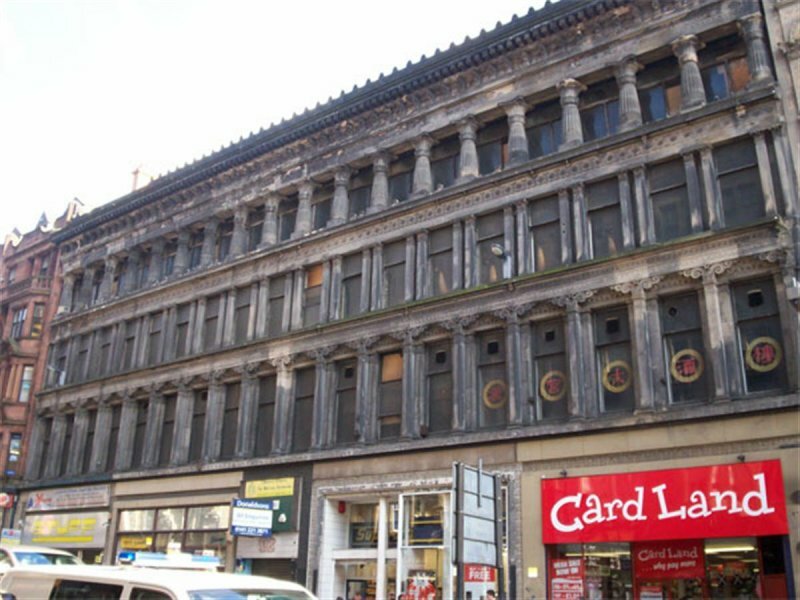 June 2009: Glasgow Evening Times reports on Union Street Properties £6.5M plans to refurbish and restore the building to either retail, office or hotel use. 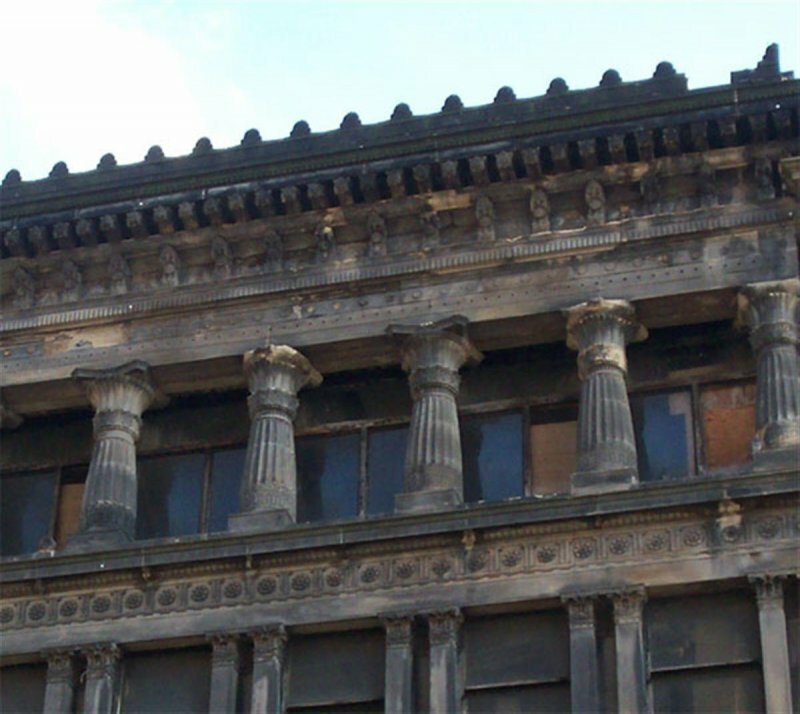 February 2010: The Glasgow Evening Times reports that USP is selecting a preferred developer to complete the restoration of the building and hopes to appoint one within 4-6 wks time. November 2010: External inspection finds the building is covered in scaffolding and a large tarpaulin poster of the building itself. It does not appear as if any work is being undertaken. Of the ground floor shop units, the north and southmost are in operation. April 2011: Urban Realm reports on a redevelopment options document published by USP (Ground Floor owners). The proposal is reported to acknowledge the importance of the building, but outlines their view that a projected gap in funding renders the project, without direct Scottish Government financial support (in addition to the funding proposed by Glasgow City Council of £1m and Historic Scotland of £1.65m) unviable commercially. The reports are noted as being available for download from the developer's website. USI Ltd (the Upper Floors owner) is on record as opposing USP's plans. May 2011: A member of the public contacts SCT to advise a demolition application for the building has recently been lodged with Glasgow City Council ref: 11/00597/DC. Local planners confirm listed building consent for demolition of the building has been lodged with the council and is now out for consultation. At this time no accompanying application for a replacement building has been lodged with Glasgow City Council, although such has been requested, as a matter of course, from the applicant. Petitions are opened to save the building with the full support of USP Ltd and USI Ltd. In a letter to The Herald, the Architectural Heritage Society of Scotland calls for an independent assessment of the viability of all the proposals and that all parties - Glasgow City Council, Historic Scotland, Scottish Government and the developers, to come together to resolve issues. July 2011: Local planners advise listed building consent for demolition of the Halls has been refused. November 2011: BARR is advised pre-planning application discussion are ongoing on between USI Ltd, the Upper Floors owners agents; The Morrison Partnership and GCC about developing a 160+bedroom hotel. This is unrelated to the Ground Floor, owned by USP Ltd.
14 August 2012: Glasgow Evening Times reports a new planning application for the Halls is anticipated later this month. 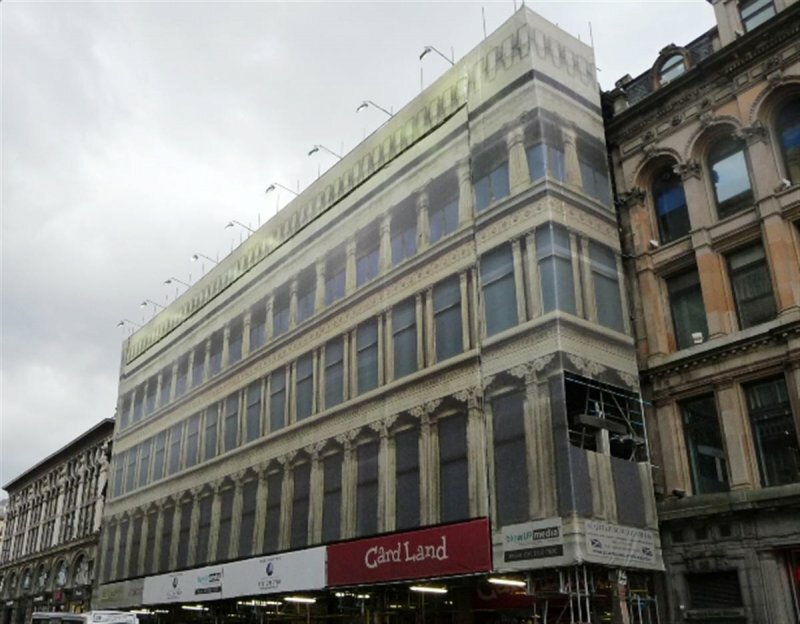 24 August 2012: Full Planning Permission and Listed Building Consent for the restoration and conversion of the upper floors to hotel use, with a rooftop 2 storey extension (stepped back from the front of the Halls) have been submitted to Glasgow City Council. 19 December 2012: Full Planning Permission for redevelopment, extension and alteration to form bar/ restaurant and retail at basement and ground level with hotel to upper floors, has been approved. Listed Building Consent remains under review. 5 March 2013: Listed Building Consent for the redevelopment of the building has been conditionally approved. 7 November 2013: External inspection finds the building remains covered behind scaffold and an advertising banner. The building is thought to remain in much the same condition as previously seen. 13 December 2018: The property is now being marketed for sale, offers invited, by Shepherd Commerical. Link to sales particulars in Additional Contacts (below).